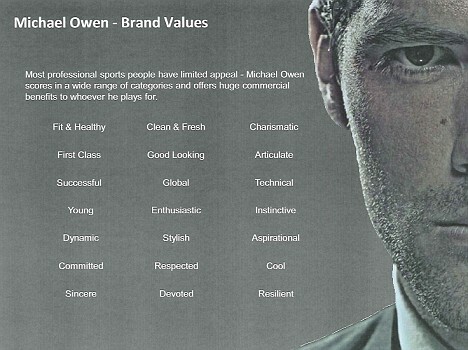 A friend of mine recently reminded me about the Michael Owen dossier that was sent round to clubs last year and the amount of values that where attached to the forward. Thinking about it again, I was amazed at how many words where thrown at this man and how any potential partner (be it club, sponsor, etc) would interpret these. Values are generally something that the outside world pays little interest in. They act in a business sense as a guiding framework internally for how a company, acts and conducts itself in the normal day-to-day. Of course, it is important to note that if the reality of how that business behaves is compromised (think Enron or the recent BP scandal) then consumers start to point at these so called guiding values and question them. We have a phrase which is ‘don’t boil the ocean’ when you create values and guiding principles for businesses, meaning lets get concise and singular with these things. If you don’t, you haven’t got a hope in hell of anyone remembering them. Maybe that wasn’t the point of his agency, instead it seems like they wanted to reassure everyone that this super human stands for and delivers on all of the 21 things listed. I think more than likely someone has got the brand dictionary out and just landed on some words that sound about right and fill up a page.